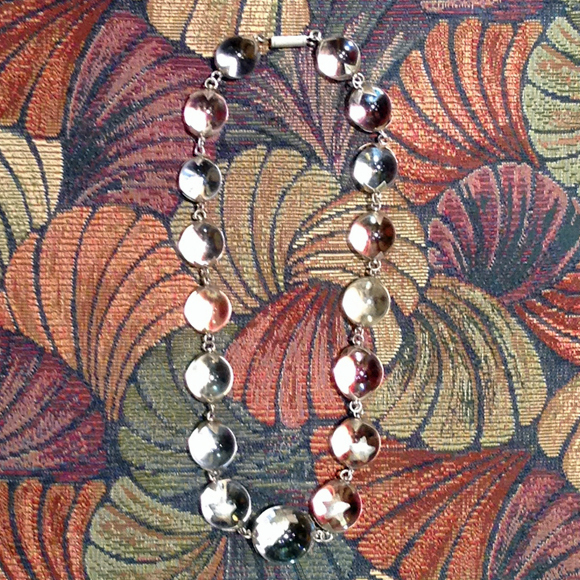 We acquired this highly unusual Art Deco Pools of Light necklace almost by accident. We recently purchased an estate of wonderful early 20th century jewelry items, mostly rings and pins. 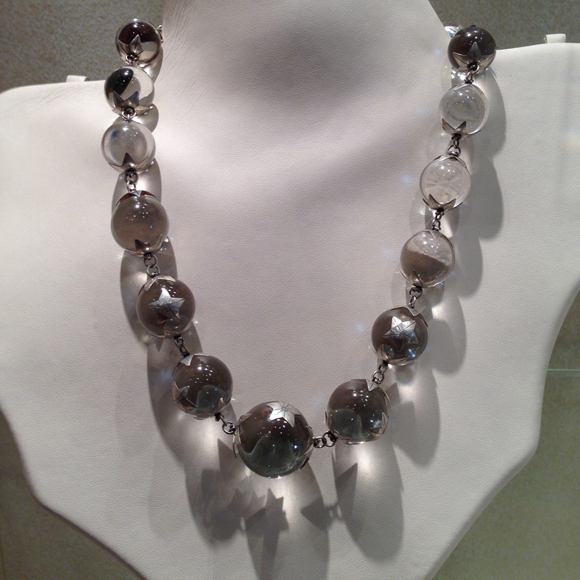 This piece and another interesting rock crystal necklace were included in the group. Since they had no gold content, we didn’t think too much about them and paid only a nominal amount. The wonderful thing about the jewelry business is that we learn something new everyday– in this case, we’ve discovered that this piece is a valuable Pools of Light necklace. Pools of Light jewelry was very popular starting around the Late Victorian era and was all the rage during the Roaring 20’s. At that time, these pieces were mostly imported from China. From the look and design of the metal work, we think that this necklace was made circa 1925. The silver fittings are nicely hand crafted. The clasp is substantially made to hold the weight of the necklace– it weighs over 5 troy ounces! Pools of Light jewelry is characterized by perfect transparent spheres of rock crystal quartz. 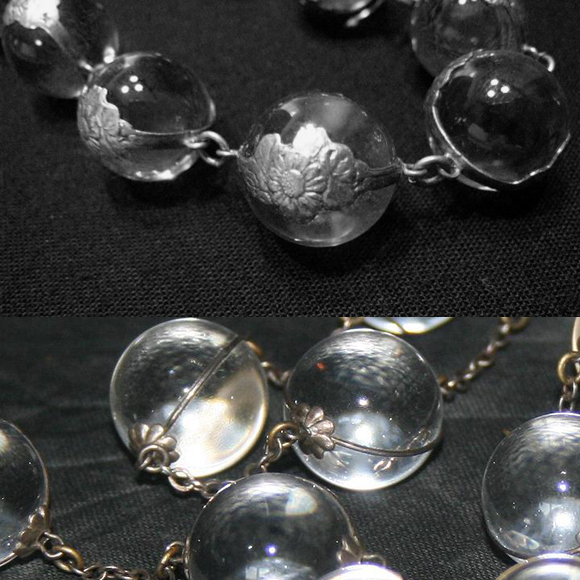 These crystal balls were believed to have mystical properties and to bring the wearer good luck. The spheres were never drilled through the center for stringing as beads, but were set into jewelry with attachments to the outside so that their perfectly clear nature remains pure. As the lore goes, the perfect sphere captured energy — if drilled through, the good luck/energy would escape. The perfect spherical shape and highly polished surface gives these orbs wonderful optical effects, reflecting everything around them upside down and backwards. These crystal balls handle light in much the same way as convex lenses do. In the Stars and Light photo, just as a magnifying lens does, notice how the light is focused into a bright point and the shadows of the stars are magnified. 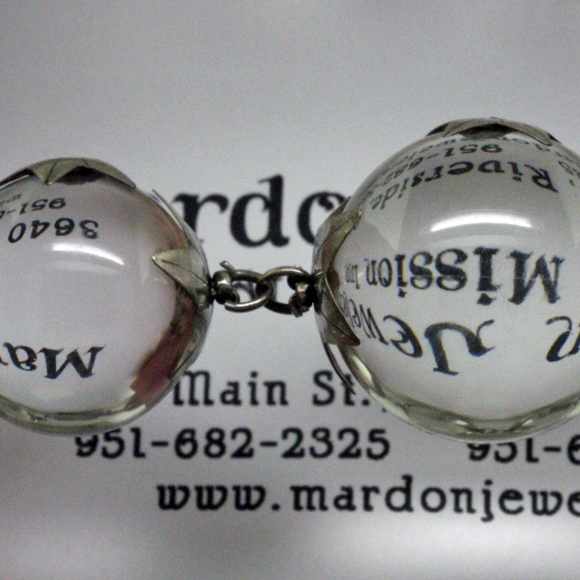 In the Lens Effect photo, you can see magnification and inversion when print is read thru the ball. When light enters the spheres at 0 degrees from the normal, the orbs will capture and reflect it back to the eye, lighting up with a powerful glow. We’ll call this the Pool of Light Reflective Effect. After looking at images and descriptions of many Pools of Light pieces offered on the Internet, I realized that our necklace is very unusual and quite rare. Most of the necklaces are set in either plain silver wires which wrap the orbs or in settings that are rather floral in character. 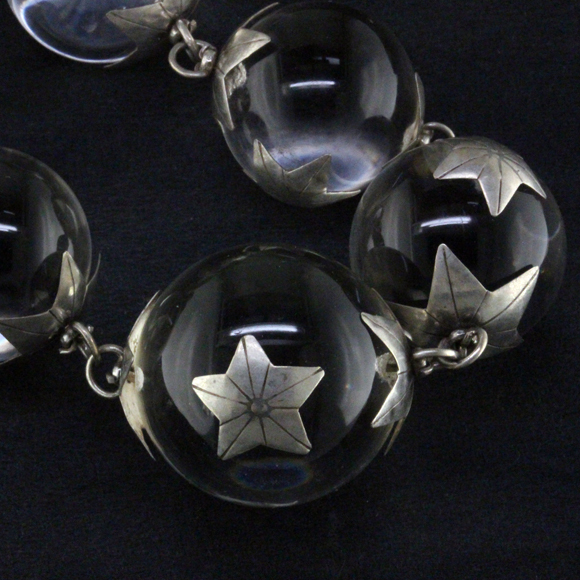 As you can see, our necklace is set with five pointed stars of silver attached to shallow holes in the surface of the spheres. Besides the two stars 180 degrees opposite each other which link the balls together, the five largest orbs have a star placed in the middle between the links. We have yet to see another Pool of Light piece with this star motif. 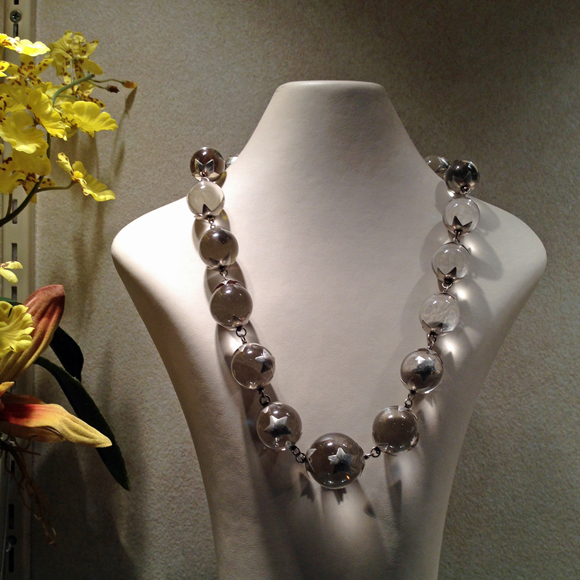 Perhaps, the connotation of stars with energy of the spheres gave the necklace extra power! Via Google search, all of the Pools of Light necklaces we found had spheres that are smaller than those in our necklace. 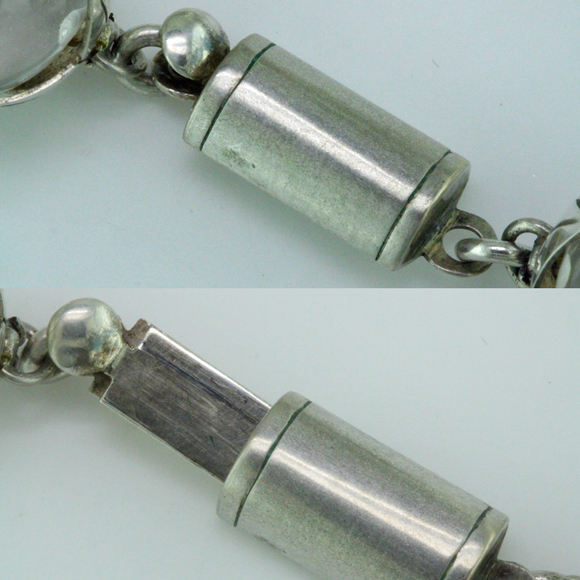 The crystal balls on our necklace range from 17 to 23.4 mm! Additionally, our spheres are in excellent condition and are perfectly eye clean, with no eye visible inclusions. At this point, we’re researching the value of the necklace. Vintage Pools of Light pieces are highly sought after and very collectible. 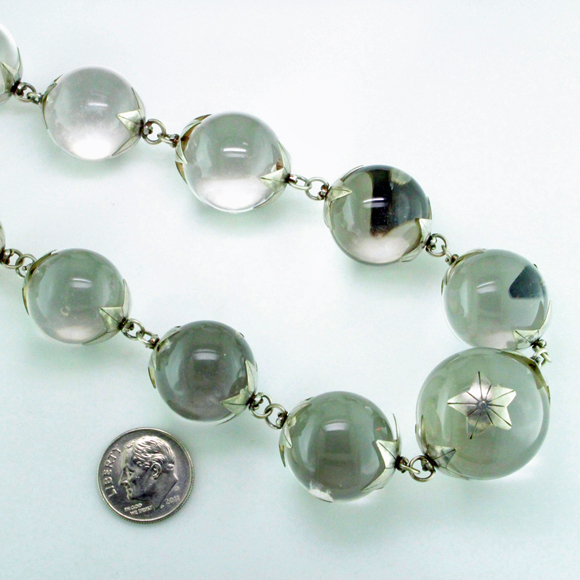 In the current market, it’s a unique design with extra large high quality crystal balls, so we think the value can be substantial. We think this would be the Star of any Pool of Light collection! This entry was posted on Friday, June 20th, 2014 at 5:34 pm	and is filed under Estate Jewelry, Featured Post, Gemstones, Jewelry Facts. You can follow any responses to this entry through the RSS 2.0 feed. Both comments and pings are currently closed.